Sussex, England. A middle-aged man returns to his childhood home to attend a funeral. He is drawn to the farm at the end of the road, where, when he was seven, he encountered a most remarkable girl, Lettie Hempstock. He hasn't thought of Lettie in decades, and yet sitting by the pond (a pond that she'd claimed was an ocean), the unremembered past comes flooding back. Forty years earlier, a man committed suicide in a stolen car at this farm at the end of the road. Like a fuse on a firework, his death lit a touchpaper and resonated in unimaginable ways. The darkness was unleashed, something scary and thoroughly incomprehensible to a little boy. And Lettie--magical, comforting, wise beyond her years--promised to protect him, no matter what. This book was recommended to me, and if it hadn't I probably wouldn't have read it as it is not in my genre at all. This is a fantasy, or an adult fairy tale. The title certainly intrigued me and made me move this book up to the top of my "to read" list. This is a well written story about strange happenings in the life of a seven year old boy and his chance meeting with 11 year old Lettie Hemstock. The story is written in the first person, and it begins with this boy coming back home 35 years later to attend a funeral. He makes a trek to the strange house at the end of the lane from where he lived and his memories of what happened when he was seven come rushing back to him. He re-experiences all the terror and wonder all over and as we read we go back with him. 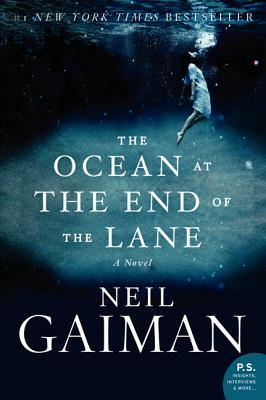 Mr. Gaiman's writing is lyrical and descriptive. He has a talent for making the unbelievable believable. I found that I was totally engrossed in the fantasy and with these strange Hemstock women. I am glad I read the book. Sometimes reading something in a totally different genre than what I'm used to helps to rejuvenate my reading experiences.